A rapidly growing shift from basic feature phones to smartphones, combined with expanding mobile device use and machine-to-machine (M2M) applications, will power a 10-fold increase in mobile data traffic in the next five years, according to a recent forecast by network gear company Cisco. Cisco also expects 3G connectivity to surpass 2G as the primary cellular technology. By 2019, 3G will be supporting 44 per cent of mobile devices and connections around the world. BY this time 4G networks will account for 26 per cent of connections and represent 68 per cent of worldwide traffic. 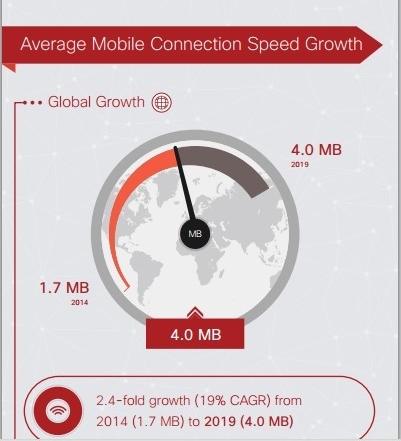 By 2019, these connections will grow 80 fold to eight per cent of the 11.5 billion device connections to mobile networks. This growth could also give rise to new business models and regulatory issues, said Burnett. “The ongoing adoption of more powerful mobile devices and wider deployments of emerging M2M applications, combined with broader access to faster wireless networks, will be key contributors to significant mobile traffic growth in the coming years,” said Doug Webster, vice-president of products and solutions marketing at Cisco.